Yesterday, the Rhode Island Department of Education (RIDE) released the statewide results from the 2016 PARCC (Partnership for Assessment of Readiness for College and Careers) Assessments. The test was administered last spring at the end of the 2015-2016 academic year. Blackstone Valley Prep (BVP) student achievement was some of the highest in the state. 55% of BVP students scored proficient in ELA and 49.5% in math, compared to RI’s averages of 37.9% in ELA and 29.6% in math–that is a double digit difference in achievement in both. In fact, there were only three schools which serve a majority of low-income students that exceeded the state averages in both English language arts (ELA) and math–BVP is one of them and all three are public charter schools. 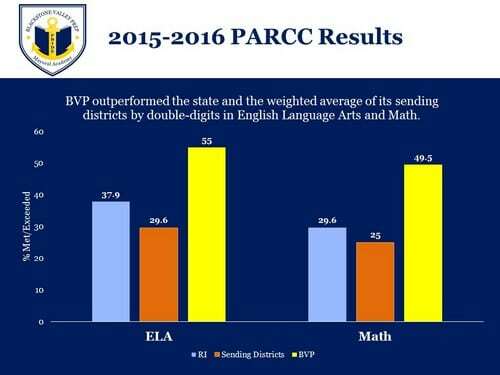 BVP Middle School results showed statistically significant improvements over the previous year in both ELA and math and far outpace the state with 57% proficiency rate in math and 50% average proficiency rate in ELA, compared to the state averages (39% and 29.6%, respectively). The schools will continue to examine the student level data carefully to ensure that continuous improvement remains a focus for the 2016-17 academic year, which starts this Monday. The complete RIDE report on the 2016 PARCC results can be found here. Blackstone Valley Prep (BVP) Mayoral Academy is a network of tuition-free public schools chartered by the Rhode Island Department of Education. As a growing, intentionally diverse network that is part of the Charter School Growth Fund portfolio, BVP offers a high-quality public school choice to the families of Central Falls, Cumberland, Lincoln, and Pawtucket and currently serves approximately 1,600 scholars in grades K-11. A member of the Rhode Island Mayoral Academies network, BVP’s mission is to prepare every scholar for success in college and the world beyond. More information can be found at www.blackstonevalleyprep.org.